Keep humidity at the temperature - related rate. Average ideal humidity is in range from 70% to 85%. Also, there are absolute minimum and absolute maximum criteria. For particular criteria refer to Autogrow.com. Note: Humidity below of recommended minimum and higher than recommended maximum will reduce water transpiration of the plant. Low water transpiration will slow transport of fertilizer from roots to the leaves and will reduce plant photosynthesis efficiency. Note for windowsill growers: to prevent mould contamination of your home never keep humidity higher than 55-60% at your growing area. Note: CO2 is an essential substance, converted by the plant's photosynthesis into sugars, starches and cellulose. If possible, use ambient air CO2 enrichment. Provide CO2 enrichment reducing boundary leaf layer by the forced air movement at the plant canopy. To prevent negative impact on the plant transpiration and to prevent possible desiccation of the plant use non-continuous air movement. Fans at my greenhouse operate on timer (15 minutes of air movement then 30 minutes of still air period). Optimal morning temperature (17C) shall be reached during heating season as soon as possible. Try not to exceed temperature (27C) in your growing area. During sunny weather use less concentrated fertilizer solution - approximately 500 ppm of total dissolved solids (TDS). During sunny weather plant needs more water to transpired to cool down leaf surface. Increased water transpiration in conjunction with high concentration of fertilizer could cause fertiliser-burn-like stress to the plant and reduce it's photosynthesis efficiency. During overcast weather use more concentrated fertilizer - approximately 700 ppm of total TDS (see details below). During overcast weather water transpiration is greatly reduced. Irrigation with plain water or with low concentrated fertilizer solution will support active water absorption by the plant. Low water transpiration in conjunction with continuous active water absorption could cause oedema-like stress to the plant and reduce it's photosynthesis efficiency. Mounted plants with exposed roots-first apply fertilizer and than, approximately 30 minutes later, rinse with plain water. 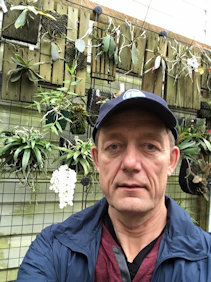 All potted plants-irrigation first (use double irrigation by tap water with 15-30 minutes interval between irrigations), than fertilizer application. Take ground oyster shell or small chunks of dolomite or a mixture of both in the amount, enough to fill~3" of gallon bucket (bucket #1) Note: Pre-rinse ground oyster-shell well to remove sea salts. Fill the bucket with tap water and allow to stay for 1 week. Note: In my conditions after 1 week TDS will increase from 30 ppm to approximately 70 ppm. Longer exposure, even for several months, will not cause increase of TDS higher than 70 ppm. After a week of exposure, pour calcium enriched water to another 5 gallon bucket (bucket #2). Leave all oyster shell & dolomite sediments in the bucket #1. Use calcium enriched water in bucket #2 for fertilizer solution preparation and apply that solution on the same day. Note: To prevent precipitation, first dissolve fertilizer crystals in a small jar of tap water and then add that concentrated solution into bucket #2. Refill bucket #1 with tap water and leave it till next week fertilizing. After each 3 month add fresh portion of pre-rinsed oyster shell & dolomite to the bucket #1. Note: With time, even if still enough sediment is in the bucket, its capacity to release minerals into water drops and TDS will not reach initial 70 ppm. Fresh portion of oyster shell & dolomite will improve it. Active growing period: from late February - March to late September. Use high nitrogen fertilizer formula, relatively high concentration of fertilizer solution and frequent application. My favourite fertilizer for Protocol #1 (see below) is a Miracle-gro All Purpose Plant Food (24-8-16) Apply it by-weekly at the beginning of the growing season and weekly from April-May. Period of maturation and dormancy: from September to February. Use low nitrogen fertilizer formula, low concentration of fertilizer solution and non-frequent application. For Protocol #1 use a Miracal-Gro Tomato Plant Food (18-18-21). Apply weekly, then by-weekly at the beginning of the season and monthly from December. I use it at 400 ppm at the beginning and the end of the season and at 200 ppm concentration in the middle of the season.